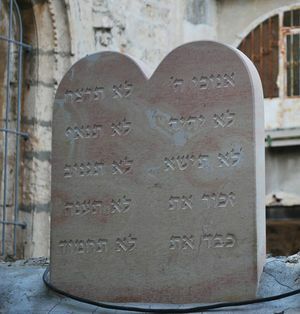 The ten commandments originated in Judaism. 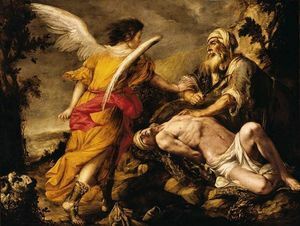 According to the Tanakh/Old Testament, God gave Abraham a loyalty test: sacrifice your only son. An angel stops it at the last second. The Jewish faith is centered around the worship of their god, Yahweh, as described in the Jewish Bible. The primary holy text is the Tanakh, refer to as the Hebrew Bible or Old Testament by Christians, of which the first five books making up the Pentateuch or Torah. Jews generally believe that God has chosen the Jewish people as a chosen people and have an eternal covenant. Jews are largely divided into denominations based on how strongly they follow traditional Jewish law, rather than on theological differences. The main denominations are Orthodox, Conservative, and Reform, in decreasing order of traditionalism. The Jews are a chosen people that have an eternal covenant with God. God is free from physical matter. A Messiah is human but not a God. A Messiah will come, since they believe Jesus was not the Messiah. There is a wide range of views within Judaism as to what the afterlife is like. Historically, some Jews (the Sadducees) even denied the existence of an afterlife. According to observant Jews, the name of God, the Tetragrammaton, should only be written but not spoken. The Sabbath is considered a day of prayer. 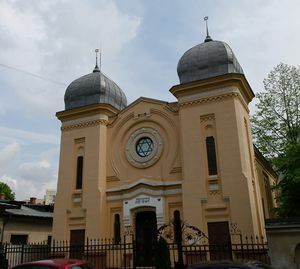 Jews worship at buildings called synagogues. Orthodox Jews refrain from any creative activity (loosely translated as "work") on the Sabbath. This law is superseded if there is a threat to human life. Orthodox Jews are not allowed to push or carry anything in public on the Sabbath. These restrictions are sometimes circumvented by establishing an eruv, which is a boundary around a neighbourhood that is marked by suspended wires. Some electrical devices have a "sabbath mode", which allows limited use of a device without an operator having to "ignite a fire" or "building" an electrical circuit. Devices that operate continually for long periods of time just to circumvent a religious law is a waste of resources. Leaving cooking devices running for long periods is also a fire hazard. Only eating ritually slaughtered kosher food. What are the borders of Israel? "The Bible is very clear that the "children of Israel", the Jews, were the divinely appointed inhabitants of the Land. " "Lift your eyes now and look from the place where you are - northward, southward, eastward, and westward; for all the land which you see, I give to you and your seed for ever." "Unto thy seed have I given this land, from the river of Egypt unto the great river, the river Euphrates"
This claim encompasses north east Egypt, Sinai, modern Israel, modern Palestine, Lebanon, Syria, western Iraq and northern Saudi Arabia (see also Exodus 23:31 ). After Joshua captured Canaan, he divided the territory into parcels Numbers 34:1-12 . This is now regarded as "the holy land" by Jews but the overall area is different and contradictory to that specified in Genesis 15:18 . It comprises modern Israel, modern Palestine and Lebanon. Apologists claim that these prophecies will eventually be fulfilled or have some other explanation. Ezekiel contains the prophecy of the territory occupied in the end times, which is broadly similar to that specified in Numbers Ezekiel 47:13-20 . Jesus was a Jew and considered himself to be a reformer of Judaism, although Jesus is considered a heretic by mainstream Jews. Inspired by Jesus, Christianity is an offshoot of Judaism that originated in the first century CE. Jews expect a Messiah to come, but the Jewish concept of the Messiah differs from Christianity and Jesus is not considered the Messiah by Jews. "Before I learned anything else, I learned the Holocaust had happened because Jews were bad and that the way we lived was different from the rest of the world because if we didn’t, the Holocaust would happen to us again. [...] I grew up believing we were genetically inferior. They didn’t see that as a bad thing – they’d sit me down and explain: “We’re special to God. Our souls are special, but our genes are inferior, just like they said about us.” How do you even begin to unstitch that? " The Jewish people have been subjected to discrimination and oppression for millennia. This is probably due to their history of being displaced from the Levant region and then being a minority group in diaspora around the world. Minority groups are often a target for discrimination. Antisemitism is justified by scripture. The Bible blames the Jews for "killing Jesus" 1 Thessalonians 2:14-16 and demonizes them John 8:41-45 . "The Koran points to another contemptible characteristic of the Jews: their craven desire to live, no matter at what price and regardless of quality, honor and dignity"
Approximately 6,000,000 Jews were killed in a genocide conducted by the Nazi regime from 1941 to 1945, along with millions of people from other minority groups. Some Jewish leaders called Judaism and Zionism inseparable. Therefore, to criticise one is to criticise the other. "The likes of Ken Livingstone and Malia Boattia claim that Zionism is separate from Judaism as a faith; that it is purely political; that it is expansionist, colonialist and imperialist. [...] Their claims are a fiction. They are a wilful distortion of a noble and integral part of Judaism. Zionism is a belief in the right to Jewish self-determination in a land that has been at the centre of the Jewish world for more than 3,000 years. [...] Open a Jewish daily prayer book used in any part of the world and Zionism will leap out at you. [...] But to those people who have nevertheless sought to redefine Zionism, who vilify and delegitimize it, I say: Be under no illusions – you are deeply insulting"
"It's also obviously true that being a Zionist and being Jewish are not the same thing. [...] But it's been widely argued that the term "Zionist" has, in some circles, become a code word for "Jew" and that bigotry against Jewish people has been expressed using the language of anti-Zionism. " While there is little doubt that anti-Semitism can result in anti-Zionist views, the reverse association does not automatically apply (which would be affirming the consequent). Some Jews are anti-Zionists and presumably they are not all anti-Semites. Therefore people who equate the two are making a hasty generalization. Many Jews explicitly reject the link between criticising Israel and anti-Semitism. By conflating the two issues, Zionists risk undermining the concept of antisemitism and the fight against it. "Mirvis attacks as “antisemitic” those who separate Judaism from Zionism. Yet most Jews who perished in the Holocaust were indifferent to Zionism and many opposed it. [...] Is Rabbi Mirvis recasting [anti-Zionist] victims of the Holocaust posthumously as enemies of Judaism and therefore as antisemites?" "we find it distressing that some imply Jewish communities are unanimous in their support of the IHRA [definition of anti-Semitism]. On the contrary, we believe that by dangerously conflating opposition to Israel’s discriminatory policies with anti-Jewish racism, IHRA politicises and harms the fight against antisemitism as well as the struggle for justice for Palestinians." The confusion between these terms may be useful for those wishing to shield Israel from criticism on the grounds of freedom from persecution. "Well, it’s a trick. We always use it. When from Europe somebody’s criticising Israel then we bring up the Holocaust. When in this country [America] someone is criticising Israel then they are antisemitic "
"True that there should be no place for antisemitism. It's also true that the antisemitism card is often played in an attempt to shut down any criticism of Israel. " "All criticism of Israel is anti-Semitic because of the specific historical circumstances under which we currently live. That is to say, the historical circumstances under which Israel and the Jews exist in the world today render any non-anti-Semitic criticism of Israel impossible. [...] Nonetheless, these circumstances are not complex, nor are they numerous. They are simply these: A large portion of the world, West and East, has come to believe that Arabs and Muslims have earned the right to murder Jews. Derived from this right, they have also come to believe that the destruction dismantling, and erasure of the State of Israel [...] Derived from the preceding is the belief that the Jewish people in general, in Israel or the Diaspora, either do not exist as a people deserving the same rights as other peoples [...] UNDER SUCH circumstances, it is clear that: The existence, rights and dignity of Israel and the Jews are considered to be intertwined to the point that no differentiation between them is possible." This is a non sequitur based on red herrings: what a large majority of people believe is not relevant to being completely immune from criticism. Jumping from "Israel is under threat" to "all Jews are under threat" is not logical, its begging the question that criticism of Israel is indeed anti-Semitic. Comparing the actions of Israel to the Nazis is very controversial and considered by many as highly anti-Semitic. Some holocaust survivors make the comparison between the two, such as Hajo Meyer, while others reject it.